Mission/Ministry minded Christians needed for a weekend of impact across the Northshore on November 11-14. Each year Louisiana Baptist churches gather for a two day convention. This year, we’re excited to host the convention in Covington! The weekend prior to the convention churches are asked to partner with local ministries to make a difference in the host communities. Here’s a snapshot of opportunities to get involved. For more info and contact info check our website. HISPANIC HEALTH FAIR, Slidell LA: First Baptist Church will be the host site as six Hispanic congregations in the Northshore region partner to conduct a health fair. The health fair will feature simple screenings such as blood sugar, blood pressures, body mass, etc. The event will also feature a Block Party with family entertainment, fun for the kids, food, and music. Spiritual health will be the primary focus as the gospel is presented in a variety of ways to both adults and children. Volunteers, especially medical professionals (doc, nurse, p.a.) are needed as well as bi-linguals and interpreters. WOMEN’S HEALTH SYMPOSIUM, Hammond LA: Redemption Christian Center will sponsor this symposium that will touch the specific needs of four communities in Hammond. Women’s Health is the attraction; however, ministries will be provided to entertain and make clear gospel presentations to children (200-300) through a Block Party Team, storying, a martial arts expo, music, and games. Moms will be treated to a few treats as well while the churches nearest these neighborhoods provide heavy interaction on order to hear their spiritual needs, pray for those needs, and to respond with shared faith. A prayer booth will be featured and manned by community chaplains and pastors. Volunteers are needed to assist in all areas, including additional medical professionals/educators. Prayer Walking across the region. Faith in Action projects in West St. Tammany. Assist with painting, home repair, etc. And of course, this weekend will be great preparation for Crossover 2012 in New Orleans as our region host the gathering of Southern Baptist Churches from all over the United States next June. 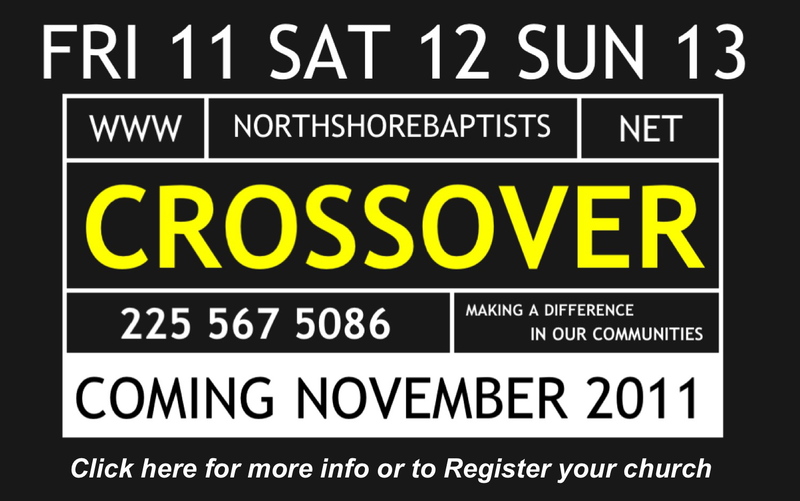 Follow the info about Crossover 2012 here. Posted on October 26, 2011, in Northshore Baptist Associations. Bookmark the permalink. Leave a comment.